Ah alcohol the most proletariat of drugs. What else can make a bunch of engineering students/photographers/dancers dress up in a bunch of old clothes then seemingly at random swap those said clothes all night long. It is really just a party trick gone full scale.... show up in a bunch of clothes that you dont care about too much. And slowly over the course of the nite, you swap with whomever trying to become all one color.... get it? Like a Rubics Cube. Am I back in college?? Truly only photos can attest. Most of the group... here shown pre-swap and with an abnormally large amount of fake facial hair. I cant believe i still fit into my 70s suit! I vowed not to post anything too embarrassing.... but of course I have to conclude the night with a run around the house. All in all a lovely time. Ended up crashing at Gregs house (duh) and having a most exciting drive back as the pre Christmas blizzard had just started. The snow of last weekend has subsided and a cold rain has taken its place. Nate Eliza and I have plans to hike up Old Rag and maybe do some climbing as well. The forecast is calling for 33 and raining at the town near the base of Old Rag, and looking outside our bedroom it is absolutely pouring. Eliza decides to bag the day and work, and the whole ride down Nate and I are down-sizing our planned adventure. And yet upon arrival at the parking lot, in a veritable downpour, we decide to bring our climbing gear anyway. I mean how often do you get to hike up a mountain with gear that you cant possibly use? We has hoped that if the weather was forecast to be 33 at the base maybe we things would change to snow higher up on the mountain. No such luck. Instead we encounter that most Mid-Atlantic of weather patterns... ice. The air is warm enough to keep the actual precipitation liquid, but as we get up higher everything freezes to the rocks. Old Rag is not really a dangerous mountain. It is just the closest we have in the Mid Atlantic. But with icy conditions over rocky ground, it is pretty exciting. We get up to the 2nd of 3 false summits, and head down into the woods to find Nates offwidth project. 15 minutes of sliding down wet snow, we get under the roof. For rock climbers who climb cracks, offwidths are the scariest of the scary. Crack climbing is basically filling the void of space between two rock faces. Thus size is the most critical factor in determining difficulty as well as technique. There are hand cracks (the easiest) down to fingers, or even finger tips. On the bigger sides things go through fists to chimney where you put your whole body in the crack. Between fist and a squeeze chimney is the offwidth... and few climbers venture near its dangerous grounds. Upward progress is made via such moves as arm bars, chicken wings, or the mystical Leavittation. All of them are grueling full body affairs. Your ankles get torn to shreds, you need a new pair of jeans for every climb, and your hands turn to hamburger. But as with everything hard... there is an enticement to the difficult. Bernt Arnold, the brilliant east German climber and solo-ist at 65 has said he loves to make even the difficult things easy. I cant put it better. Nates project though offers no easy solutions. Given the weather, we cant try and climb today, but just visualizing the moves is hard enough. 20 feet out a roof via a 6 inch crack, then the apparent crux turning the lip to gain the wider squeeze chimney. A shout out to all the strong people who want to come try this... Definitely worthy. Nate and I move further down and away from the trail down to the Wall that Dreams are made Of. Last time i was here it was bloody hot, and i was without water... after climbing I had a harrowing descent until it rained and i finally got some water. This time the weather couldnt be more different. Nate gets started aiding and the sun miraculously breaks through. It becomes downright pleasant. Still we have pushed the boat out rather far, and relish the quick opportunity to dry our wet things. Surviving in this weather for days on end would take quite the diligence to maintain dry and capable equipment. We finish our climb and take a peak at nearby tempting rock snacks, but the sun is already descending and its time to head down. We have descended further down the side of the mountain than i remember and it takes 45 minutes to gain the ridge, and the trail down. It is maybe 30 minutes from dark, and its really time to head down. However the strange weather has left us with one of the most brilliant moments I have ever experienced in the hills. What is left of the rain and clouds have sunk down to the ground. Settling in the valleys and between the hills like molasses. And just as think. The tops of the clouds appear opaque. From our viewpoint above all this only a few tops of mountains peak out above the clouds. We cant help but take a few minutes and relish the view as it really is breathtaking. It gets dark, and my head lamp as usual sits nicely on my office desk. I know the mountain too well though and even in the dark with no moon, its no problem. I even take a minutes to do my scramble that I usually use to pass the crowds at the chimney portion. Having reserves at the end of day like this feels like maybe I am in better shape than I would appear. We dont get a ton of snow in Baltimore, so when we get an early December dusting, Eliza and I took advantage of the situation and went for a hike. Though we had originally planned to do Old Rag we decided to check out something new and quite a bit closer. On my way out I66 dozens of times I have noticed what looks like a cliff band in my rear view mirror as you pass through a gap just 20 miles out of DC. I figured it was on private land being so close to DC so didnt give it much thought. But today as we drove to the base of the gap we noticed that it is actually a wildlife preserve complete with miles of trails. Perfect! Signage indicates that climbing is not allowed, which in my mind is a good thing, that means there must be rocks up there somewhere. A couple neat ruins are near the beginning of the hike, including an old mill that made grain for US troops in every way from the American Revolution to WWII. Looking back at the train tracks at the start of the hike. We never did find the rocks. There was quite a bit of snow up on the ridge, and we were momentarily distracted by a large group of hikers dressed up in probably 2500 dollars worth of outdoor gear apiece. On the way back down Eliza and I entered an interesting discussion upon finding a cairn. Given my engineering background it is always fun to apply some of these principles to the natural world. A cairn is a stack of rocks usually at a junction indicating that you are following the right path. These can be tremendously useful, not necessarily for an easy hike in the woods on a wide path, but many climbs are approached using these unobtrusive helpers. The reason they work is because they are an ordered system, rocks very rarely organize themselves into piles. This is a classic example of entropy the main component in the second law of thermodynamics. This law basically states that the disorder in any system, and indeed the universe is always increasing. Perhaps the most famous example is that you often see a glass falling off a table and crashing into a million pieces (a more disordered state) but i doubt if any one has seen these same pieces suddenly jump back onto the table and reassemble themselves. This makes sense, but what about the glass in the first place? Well we humans expended a huge amount of energy in making that glass. In melting the sand, in forming into a shape, in obtaining the knowledge of the process. So back to the question of our humble cairn. Clearly someone spent some energy piling the the rocks so that we may know the way. Hence in a purely thermodynamic sense, more energy was put into piling the rocks, than the rocks lying in disarray on the side of the trail. However when you include the human intelligence element things get a bit more muddy. Lets say going the wrong way on this trail adds on average an extra mile to the hike, and 1000 people a year could take this detour. I highly doubt that these 1000 miles of walking saved are of less value than the 30 seconds it took to create the cairn. But I suppose the whole hike is arbitrary anyway. Certainly walking around in a giant circle only to end up back at the same place has not somehow increased the order in the universe. But then the question of why certainly rears its ugly head. Some hobbies have direct benefit. My mother knitting for example provides warmth to many people. A cook or furniture builder do much the same. But my pursuits, hiking, and climbing, do nothing for anyone. Perhaps I gain a bit of physical strength, so that my adventures can increase in scope, but most importantly what I gain from these is a peace of mind, a confidence in my abilities, the act of pushing my limits. I guess that's a lot to intuit from a pile of rocks on the side of a trail, but I suppose what I take away is that the rules that govern the physical world certainly apply to us as humans. However we can not discount the unique perspective that being self aware gives us. In any case Ill leave this with an appropriate picture. Day by day our party increases, from our initial 2 all the way up to 11 at one point. We have quite the tent ghetto occupying one site. Luckily given the fullness of the campsite we are not hassled too much by the camp staff. We do an enormous amount of climbing. The daily routine is to wake up at dawn, split into parties determined the night before, and climb till dark. We rarely see the camp in the daytime. Enumerating such an outpouring of climbing would be only slightly more interesting than watching grass grow. So ill uncharacteristically stick to one story. Suffice to say the other climbing, both done by myself and by the others of the group was spectacular. After my initial day on Solar Slab, the doubt i thought I had banished still nagged my mind. Aided by a bought with some sickness early in the trip, my foot still injured from the hike with Nate, and the running dialogue in my head, I had climbed quite well, but not led much. Towards the end of the trip we had decided to do a day at Black Velvet Canyon, home to some of the best climbing but dark, shady and cold. It was also home to my favorite climb of that trip Triassic Sands. With a 10c crux down low and then endless 8 handcrack up high it is a climb to dream about. The only thing I had regretted last time was that I had not led the climb besides the easy first pitch. Having not led anything harder than 5.6 and that almost a week ago, leading 10c seems ill-advised at best. Its the first climb of the day, and it is not warm. The crux comes as soon as you leave the belay. Tricky finger locks though 3 small roofs. I place 5 pieces in 15 feet of climbing, and just over the crux I get a decent jam to shake out. My arms are tired and with the cold I can not get the blood to leave my arms. I switch arms for 15 minutes trying to shake out. Things arent improving so I take a look at the gear i still have to finish off the pitch. To my horror it looks like I have 1 piece left that will fit the crack which is almost identical in size for the next 120 feet. This puts me in quite the predicament, as leaving that piece behind after say 30 feet will mean that I would take a 180 foot fall which is clearly unacceptable. With few options I decide to use a technique that only works when the crack remains the same size. After climbing up 5 feet, and the piece is at my feet, I reach down and slide the piece farther up the crack. This works pretty well, but wears on the mind. Nearing the belay as I take out the piece and replace it, I am for a brief instance exposed to a very very long fall, the threat of which goes away as soon as I replace the gear. With my forearms still tired from the climbing down low, being honest with my abilities becomes paramount. It is exactly these situations which provide the crucible through which I extract the mental benefit of climbing. The last 25 feet are too wide to protect with my last cam, so I bid it farewell and climb the last bit to the anchor. The wind blows, i cant feel my hands due to cold and overuse, but it is impossible for me to fall off, and i soon clip the chains. Even the long belay in the cold does nothing to deter my mood. Ok thats all contemplative stuff. The rest are just a few of the better pictures from the trip. Sometimes photos are more than they appear, and other times they actually do an amazing scene justice. My favorite picture at the trip. Jeff boiling water at daybreak. She both is both an explorer and a destroyer. Dora shows off her love of purple. With some apprehension I begin my yearly long climbing trip. In this case our collective has chosen that most accessible and frequently unscathed by the winter weather: Red Rocks. Located just outside of Las Vegas, with its drug and addiction addled neon haze a blight on the desert, Red Rocks manages to preserve a modicum of wildness. The transformation is at once startling and immediate. Traveling west from the loop highway you pass strip mall after strip mall, Walmarts, Barnes and Nobles, Potter Pier and Barrel, countless others all competing for that valuable purchase on your retinas, and suddenly... nothing. Cliche as it may be, there seems to be a line in the sand. The road narrows from 3 lanes to one, the lights stop, the building subsides not slowly, but immediately as if the ground 1 foot further along is completely uninhabitable. It is in fact this transition that illuminates the whole town. All the land was like this once, wrestled into submission by the human presence. A corrupt alchemy turns sand into asphalt, the prickly pear into a 30 story neon theme park ride. Now all cities make their mark on the landscape, and lest i seem a Luddite, let me clarify. New York, or Baltimore for example have by no means left their environments unsullied. Far from it in fact, but there seems a purposefulness to building a port for trading goods. Or locating next to a river or lake or at the base of a mountain. It is more the arbitrary nature of a city in the middle of the desert that riles me more than its environmental impact. Although surely the desert being one of the more delicate of environments particularly displays the harsh hand of human development. Red Rocks, located not ten miles from the city may seem an escape, but the constant glow of the city, and the steady march towards the canyon make clear that the wildness preserved here is only temporary. The apprehension I felt arriving stems from two sources. Predominantly city bound for the last few months I feel trapped, away from the lonely mountains where I can usually find some peace. And having been away for so long, particularly technical climbing, do I still have the technical skills to be safe and enjoy myself. Because if I climb scared, the joy, and revitalization I normally glean from a trip like this is lost. Climbing with little confidence, always thinking about going down, not committing is the antecedent of why I am here. I have arrived second, just barely. Gil Moss, the younger brother of my good college friend Jeff, has driven maniacally across the country from NY beating me to the airport by about 5 minutes. On the way to camp we devise a simple plan that should frame my mind nicely for the beginning of the trip. Gil and I around camp some days later. We wake around 4:30am, the days are short here in the winter, barely 10 hours of light, and with time restrictions around the access road, long routes hold significant threat of becoming night-time epics. Furthermore, we have a commitment to pick up Dora at the airport at 3:30. So clearly we have chosen Solar Slab, a 2000 foot romp up easy terrain in the sun. We park outside the loop road so we can get an early start. This adds an extra mile or so to the hike, but the time gained clearly makes up for the extra distance. There is a horrible scale about the desert and Red Rocks in particular. It is nearly impossible to get truly lost. The 2000 foot walls tower above you and the lack of foliage makes macro knowledge of your general position relatively easy to ascertain. But the small scale is quite elusive. Braided trails, terrain that lets you walk pretty much anywhere, gullies and washes that appear from nowhere, all conspire to make your route the most inefficient one. And the whole time the scale of the place conspires against you. The boulder in the distance that seems maybe 200 yards away and 10 feet tall takes 20 minutes to reach and ends up being 50 feet tall. The mountains at once appear close enough to touch and yet the further you walk they don't get any closer. We do manage to reach the bottom of our route just around daybreak. Given the length of the route and our time constraints we employ a technique called simul-climbing. Gil leads off just as normal with myself belaying him, prepared to catch his fall. When he has gone the full rope length (200 feet) instead of stopping and him bringing me to his position we begin climbing at the same time, keeping the rope taught between this. This allows the motion to continue upwards and can drastically reduce the time needed to climb a route. Clearly this is reserved for locations where a fall is most unlikely. The system however still works and a fall would not result in any injury. Using this technique we climb the first 500 feet in under an hour linking together the 4 pitches into 2. This puts at the base of the main slab. The climbing is easy but enjoyable. The sun baked cliff lets us climb comfortably and confidently. The highlights of the upper slab include a variation corner the Gil leads, a bit harder than the rest but the best climbing, and a massive pitch at the end to finish off the climb. I linked the last 3 or 4 pitches, probably 500-600 feet of climbing into one long continuous piece of movement. We reach the last rappel anchor and it is not even 11am yet. The climb goes up another 500 feet of scrambling... but the long descent from this finish can not be afforded given our schedule. The rappels go cleanly, the only hangup is the we drag our rope through a cactus halfway down, and suffer the consequences as my hands find every needle on the 200 foot cord. Back at the car and driving to pick the next member of our team, Dora of QC fame, and the transition back to the city seems more bearable. I am less angry than thoughtful about what I see. It is truly amazing what confidently climbing a long moderate route can do for the psyche. The adventures with Nate continue. I apologize in advance for the lack of pictures as our trip did not afford us the luxury of carrying a camera. Actually I think Nate has before and after pics that I wil have to find. A month or two ago I mentioned my desire to hike all of the AT in MD in a day, and my subsequent disappointment that Eliza and I had postponed. Well I finally got my chance, and by chance not with Eliza but with Nate. There is a little history here, as I have hiked significant portions of the AT in my youth accompanied (or more like accompanying) my step-father Tom. These were some of my earliest cognizant memories of really loving the outdoors. Among our exploits we hiked all of the AT in MD over a 3 day weekend. With the lack of decent hiking in MD , sometimes we have to making the hiking indecent instead. This part of the trail is not particularly beautiful, or over interesting terrain. Instead it is an endless view of tight forest, over rocky ground, with only 3 or 4 hills in the entire 43 mile stretch. 43 miles?! As we are dropping off a car at one end, we notice how long it takes to drive 43 miles, let alone walk that distance. We get to the northern point at Penmar at about 2 am after leaving at midnight and doing some car shuffling. Nate and I have a penchant for these early (late?!) starts it seems. However the goal is to make it through the night and hopefully the sun wont go down on us till we are nearly done the next day. Not only is is dark, but its raining lightly, rather chilly and the visibility is at about 10 feet. Not that the trail is that pretty anyway in the dark. So we start off, and perhaps 1 mile in, we make a wrong turn and are lost. Well lets rephrase that. We arent lost, but we arent on the trail either. Since the whole hike follows a ridge that is pierced a few times by roads that run through the gaps, we decide not to retrace our steps, as doing so this early in the hike could be too demoralizing. 6 miles later we finally find Raven Rock road and take this back up the trail. Without notice, my stomach churns, and I come pretty close to losing some precious calories, but i get settled and am not bothered by it again. Similar to last week and aid climbing in the dark, its sort of a nice experience, when your senses close down to such immediate surroundings. Here the trail was the same, the mist closed in tight around me, and you are just alone with your movement. The idea that these are great times for introspection are false, at least in my case. I am so focused on my movement, and the small happenings of my tiny space that I am not off thinking about my job, or pressing things at home, or how i need to clean the basement. But i suppose it is just that, the stripping away of all the mental clutter. It is almost like preparing the field, tilled, and waiting for seed. That is the usefulness of an adventure like this. And strip away we did. Mile after mile after mile. A slight decrease in the rocks underfoot became big news. The slight glow of daybreak became inspiring. We knew we didnt come out here for the enjoyment of the act, but perhaps to know our limits a bit more. At 9am we pass Annapolis Rocks and get down to the shelter near the crossing of I70. We take a quick nap, the quickest 20 minutes of my life. Though not quite halfway, mentally I feel just about halfway though. With our car about 19 miles away in one direction and 25 in the other, we really have no options but to continue. On top of Lambs Knoll about 30 miles in I give Eliza a call (my sweet lamb) and within a mile afterwards finally develop the blister I have been worrying about for the past 5 hours. Luckily I have my Waldies which I brought just for this purpose. Maybe 10 miles to go. On the last ridge with maybe 5 miles to go it finally starts to get dark and we are so so done. The ridge doesnt want to end, and the lack of chit chat exposes our weakness. We basically fall down Weverton and to our car. With our remaining adrenaline we drive up to Frederick (45 minutes) and have a brilliant meal of central american food. Another 30 minutes and we are back our second car at Penmar. With no discussion we push back driving back and promptly pass out for an hour. We finally get back around midnight. Another 24 hours. Pushed the envelope a little further, and I think ill be paying for this one for a while. I have briefly mentioned my new acquaintance Nate. We had a fairly adventurous day doing some practice aid climbing up near Frederick. Nothing too crazy but a great day out. However I saw in his eyes that day a twinkling of craziness, and if I were to guess I would bet that keeping his friendship would likely involve going on some interesting trips. Nate really wants to do a big wall. And I am not sure if you have been to the mid-Atlantic region but 3000 foot bullet granite walls are not its forte. We do have some big stuff down in NC and up in NY and QC but these are 12 hours away and not really feasible for a weekend trip. However the venerable Seneca Rocks in WV while only 400 feet tall or so, has an air of commitment, and almost alpine feel at times. So for our practice big wall we decided to head into the WV hills. -The climbing is hard enough to force you to aid climb. This means that you make upward progress not by using your hands and feet and muscles... but you hang on a piece of gear, walk up in a ladder and place another piece to hang on. This three foot at a time process can be exceedingly slow. -Lastly because you are living up there and you have brought food, water, sleeping gear, camp stove, a ton of climbing gear AND the kitchen sink, it becomes literally impossible to carry this with you on your back. So you are forced to put it in a very large, and very heavy bag, and using various mechanical devices haul this monstrosity up the wall with you. The bag is affectionately called The Pig. So that bring up the second important question about big wall climbing. Why on earth would anyone want to do something so asinine? This is a good question. The work required to ascend an equivalent height by free climbing is likely ten-fold. Aid climbing can be mentally draining. You move at a snails pace. However... the usual answer is that big wall climbing allows you to go where you otherwise could not. This is quite true. Lets take a look at my one of my favorite. El Cap is perhaps the most beautiful piece of stone in the world, and I will never be able to climb it without these tactics. Only good climbers get up at all and only the best of the best can do it in a day, thus negating the need for all this extra hoopla. However viewing this style as a necessary evil I think is detrimental. As recently related, climbing should be about the experience, and if the actual act of moving upwards by the mechanism chosen is unpleasant, then just being on El Cap is not enough. However in the right mindset, this utterly slow painful process can become quite beautiful in its own right. The manufacturing engineer side of me I suppose helps, but there is a rhythm and efficiency in managing all these complex systems that is quite fulfilling. Doing the same small movements over and over again, and each time doing them a millisecond faster, or using 1 less calorie. Or thinking about the juxtaposition of my 230 pounds sitting on a tiny piece of gear about the size of my fingernail... and somehow this tiny blob of metal is going to help me scale something of such immense proportions. Its the joy of being so tired at the end of the day that the idea of sleeping 2500 feet off the ground means more about the SLEEPING part and less about the 2500 feet of exposure part. Ok its not the perfect melding of mind and body that I love about pushing myself free climbing, but its close. Ok sorry to take so long to set the stage. Back to the trip. We get out later than expected, we had set up the porta-ledge (our means to sleep on the side of a cliff) and probably didnt leave Baltimore till 10pm Friday night. Within 10 minutes of leaving, we are pulled over driving through west Baltimore, apparently a Subaru full of climbing gear and 3 guys in outdoor wear is enough to warrant a stop. The cop ends up talking to us for 15 minutes about climbing! How strange, and we proceed on our way. 4 hours later Nate has done a brilliant job of getting us to the Seneca parking lot, where we start to pack our bags. Now WV is known for its colorful local flavor but I have never quite experienced it like this. Remember its 2am by now, and we are the only car in the parking lot. Let me re-phrase, were the only car around. A beat up old rav4 rambles up and stops not 5 feet from our car. I hold some mild alarm, but when the window rolls down out appears the most grotesque, inebriated, and decrepit human I have ever seen. Somewhere between the age of 30 and 6 feet under, with 4 teeth and fewer strands of hair. It seems that we are a blessing from the heavens on this her birthday night celebration. Before our arrival she had harbored no hope of sating her innermost desires, content to drink away the night with her dearest girlfriends. But then as if the skies had opened up and Gabriel himself had deposited three strapping young lads right outside her door. Almost in arms reach... almost. We are careful to keep our distance, and as clearly her motor skills are quite addled it quickly becomes more comedic than scary. Her advances very quickly move from slightly suggestive to racy, to downright lecherous in just a few minutes. And as we are stuck packing our gear we have no choice but to endure he verbal advances. For the young readers, I will spare the juicy details, but suffice to say that despite several gallons of alcohol clearly swishing about in her veins she put together quite the elaborate fantasy. We finally get packed up and bid the fearsome WV mountain cougar a good night as we should our packs and head towards the cliff. Our packs... I had mentioned that The Pig can get quite heavy. And being the large guy in the group I got to carry the 80lb bag. Now I am not really known as a aerobic powerhouse so the 600 foot hike to the base of the east face could perhaps best be described as soul crushing. The last 50 feet to Broadway ledge even require us to get out the haul system and haul The Pig up the last few exposed steps. Its about 3 or 330 am at this point and just sleeping on a piece of land I could have hiked to seems a bit lame. Time to do some climbing. Being the "experienced" aid climber in the group I get the lead. The plan is to climb the first pitch of Pollox usually a wonderful 10a up to some bolts and sleep there before continuing up higher the following day. Luckily the climb follows a crack so the gear is plentiful and straightforward. I leave the ground and with my sputtering 3 LED headlamp the world suddenly becomes very small. Nothing exists but a 4 foot ring of marginal light, my rope between my legs, and blessedly a perfect crack leading up and out of my field of vision. Perfect conditions to enjoy the things I mentioned earlier about aid climbing. Since there is nothing else to do, getting a good rhythm and working on the sequence become goals in themselves. Too quickly I reach the bolts and set up an anchor to bring up all our stuff. The hauling goes quickly and amazingly we even get the ledge setup relatively quickly in the dark. I rap down to sleep on Broadway and let the two guys (who have never slept on a porta-ledge) enjoy the night out. As I get into my sleeping bag and begin falling asleep I notice twinge of dawn just starting to lighten the horizon. It has been a long long night. Enjoying some of Nates' homebrew. This is a notable big wall tradition, usually substitute Pabst for the exceptional home brew. I realize later that I carried and hauled that 6 pack up 800 feet to this point. The next day we practice some of the main tenets of big wall climbing. Namely spending as much time on the ledge eating and not going anywhere, and being as slow as possible doing anything. Our original plans to go up and over descend into a pleasant two pitch day of watching Nate aid up to the summit. At our blistering pace we have used up most of the day so we rap back down and do the heavy hike back to the car. Thankfully Nate drives and we get home at 9 pm less than 24 hours after we left. Good times. Just a quick climbing trip up to Annapolis Rock, which peculiarly is located west of Frederick and nowhere near Annapolis. I was accompanied by the lovely Eliza, and our goal was to get off our butts, as we have been feeling particularly lazy these past few weeks. Eliza checking out the view from the "summit"
Since we were feeling a bit out of shape we naturally proceeded to the most challenging line on the cliff, Black Crack. Reasonable holds but quite steep and quite a workout. Elizas struggled with this climb and I believe part of that was our mindset that day. We had come up to get back in shape, to train, and generally feel good about ourselves. These are not explicitly, but certainly lean towards, goal-oriented behaviors. In reading one of my favorite mountaineering books recently Extreme Alpinism by Mark Twight, he says that goal oriented behavior has as its antithesis failure. But in failing have you negated the good climbing you did up until the point of failure, the hard work required to reach that point, the beautiful fall day? Of course not. And especially in the types of climbing we do the "summit" is so arbitrary. Usually we have just walked to the base from the top anyway! Perhaps this is self justifying as I do fail on many of the climbs and adventures I go on, but I prefer to at least try and enjoy the experience as much as the top. A couple easier climbs renews our disposition and we soon head down. Eliza spots another snake on the way down and declares the day done. At DDI human and particularly face scanning has always been a priority of ours. Accurate and believable face capture has maybe a bazillion applications... and I may be under-estimating. At DDI we are generally hardware agnostic, and human capture has been along those lines. Capturing people the two most important characteristics you look for in a system are speed of capture, and color rendition. We have moved from a system that took 3 seconds to capture and captured .3MP of color. And now we can take a shot in literally the blink of a flash, with 24MP of color that let you zoom further that you could want to. The system was developed in Scotland by our good friends at Dimensional Imaging, and we call our implementation Shapeshot. With hardware we feel great about we recently attended a technology meetup called TEDX MidAtlantic TEDX is like a Twitter version of a tech conference. Eclectic and knowledgeable speakers give mini-presentations all day long. The result is more a meeting of the minds than a sales conference. Usually a national event they are starting to do regional versions, which given the intimate format makes a lot of sense. So we went not to talk, but to showcase some of our scanning technology.. Showcase being the operative word. The crowd here was certainly savy, but savy in 3D scanning not so much. So education was the primary goal here... but not a one way education. Not only was this a great chance for us to educate the tech-intelligentsia on the wonders of 3D scanning, but for us as well to learn about the tech-centered passions of the people we met. These passions would be our next threads on which to apply our 3D scanning. 3D scanning is more of an enabling technology than an end in itself. Hence I know a little about architecture, naval engineering, aerospace, automotive, prosthetics, art enlargement, and historical preservation... to name a few. 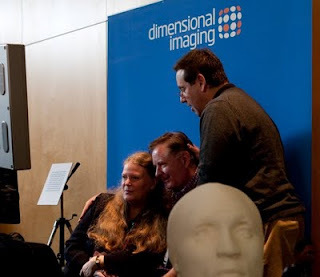 And this was a great opportunity to meet the people for whom 3D scanning provides the line from which to connect their respective dots. Overall we scanned 200 people. More info on the scanning technology and our Shapeshot concept in particular. Also check out our post at the DDI blog. But as excited as enumerating our scanning procedures may be, i think ill pass on the technical details. I had mentioned that South Korea was way more industrialized, clean, and generally more first world-ish than i expected. However that does not mean its a a carbon copy of our western world (ok there was a 7-11 out our front door and a McDonalds around the corner) Perhaps the biggest difference was the food. First the bad... as it was what we noticed first. Octopus jerky, deep fried silkworm pupae, cheese-sticks with fish parts embedded, soup with ligaments knees, and of course Korean blood sausage. I say this with a caveat of course... I eat scrapple (once a year) and that is made from scraps of scraps of scraps. And the good stuff. Bi bim bab, basically rice and veggies then you put on your own chili paste to suit you tastes... delicious. Dumplings,bbq,and strange but tasty pastries spun from sugar... i think they translated to 10000 strands. Also the written language is syllable based. there are only 25 characters rather than the 100s in chinese. For each syllable they stack up a set of 3 or 4 characters to make what looks complicated at first... but is really just a collection of more simple characters. These syllables then get used as the building blocks . We think of the North Korea / South Korea conflict as relatively benign. Sure there have been some greater rumblings from the North lately, and certainly there is a dangerous regime in place. But we almost view those as future threats from our American viewpoint. But for South Koreans, the war with the North didnt end in the 50s (in fact it never did end and the two sides are technically still at war) and there is a strong sense that war is here and now. Air raid sirens (the benign almost anachronistic relics here in the US) mean that everyone stops what they are doing and wait for instruction to proceed to shelters etc. There is a certain military feel on the streets. I think this has given the South Koreans a sense of urgency and importance to their daily lives i find somewhat envious. I sometimes feel an American complacency in many spheres of life. Our place in the global mindset, our arrogance with our language, even how we work our business. It seems that the threat of the North has given the South Koreans a catalyst for their impressive growth these last few decades. After two weeks, we finally finished all our intended work, but we has been run ragged. Due to the type of scanning equipment being used, we would have to concentrate for a few minutes and then sit around at wait for 10, and again and again. This yielded little true down time to unwind and at the same time killed our motivation. We watched a lot of green bars passing slowly across the screen, and copying many many gigabytes of data to all our backup drives. Next time i think we will ship a real server. Harry tries to keep the troops in line. Pete is suitably dispassionate about the prospect of another day on the hamster wheel. As if traveling to Southern California one week was not enough, work decided that maybe South Korea would be more appropriate. Have been missing my time with Eliza. Actually, despite the time away from home, I lobbied pretty hard to get put on this one. I mean if one of my goals is to see new things... it cant get much more new than South Korea. My other overseas work experience was going to rural India. If you recall I was pretty amazed at the difference between the Indian culture and ours. Sure there were nice areas... but the poverty and squalor were particularly overwhelming. Naively I expected South Korea to be similar... I couldnt have been more wrong. I hadnt realized it but time had been doing funny things. It already gotten dark when we took off... (7pm) and just never got light again. We landed at 4am in Seoul and it had never gotten light... longest night of my life! Our bodies think it is sometime mid afternoon but the skies tell a different story. In my mind I all of a sudden visualize the globe, and my place on it is nowhere near usual. The airport is actually in Incheon a new city created on an island 30 minutes outside of Seoul. We drive into the city with the first pre-dawn light filtering down. And we drive, and drive and drive. At first on gleaming highways, and then forever through town. My ignorance is starting to show, and later will realize that the 10 million population (23 in the metro area) is much much larger than NYC. My first sunrise over Seoul. In the center of a town there is a pretty large hill with a TV tower / public attraction on top. Taking pictures at 6 am it catches my attention. We have one day to adjust before we start work. Speaking of which... why am I even here along with some of the most talented people at work? A little history may be in order. Many people think of East Asia as a continuous homogeneous mass. Can I tell the difference between a person from China? Korea? Japan? This is certainly not a great mix and the cultures are quite different. WWII did not start with our entry in Pearl Harbor, or even the Bltizkreig in Europe. Japan, with imperial intentions, had been relentlessly attacking mainland China and Korea throughout the 20s and 30s. This was a particularly brutal war, with such atrocities as Nanking in China where 250,000 were killed in a systematic massacre. There were similar events in South Korea. In Seoul itself the royal palace was almost completely burned to the ground. Though the palace has been 70% rebuilt there only remains one original royal building. It was this building that we were going to be scanning. Harry and I cant sleep, so we partake of the all you can eat breakfast and go to check out the site. We are scanning an original palace and it is quite beautiful, traditional with the rice paper rooms and intricate woodwork. We sure will have our work cut out for us. On the same campus lies the national history museum where Harry shows his cultural literacy by matching shapes to shapes. We catch up with our co workers for an afternoon hike. We ride the amazing metro system out to Bukhansan national park which literally encircles the northern half of the city. The whole city is in fact surrounded with beautiful mountains with gleaming 500-1000 foot granite slabs. I could learn to like it here. Not a great picture, but that is 1000 feet of rock just lying within site of 10 million people. And this is just one of hundreds of such formations. After some initial wrong turns we make manage to get a nice hike up past some temples. A neat map at the trailhead. The fun is over however and we settle into a 12 days straight of scanning 10-12 hours a day and processing 6 hours a night. Not much time for anything but work and a little sleeping. However first impressions of Korea are of a gleaming modern city. Bustly and with a certain pressing imperative to get what needs to be down quickly and efficiently. This is not an idle city.... I like it already. My job occasionally involves travel. As a 28 year old guy, thats for the most part a good thing. Meet different and interesting people, see neat places, be a little more independent than a day at the office. But as a get a little more settled in a life involving someone else (that is you Eliza) the time away this year has occasionally become more than I would otherwise enjoy. But when the destination is Southern California, i get a weekend to do whatever I want, and I get the chance to hang out with some long lost friends... my planning mind goes into overdrive. I can see Anne Marie, in San Diego, go to JTree, Maybe do a thing or two or the southern Sierra. All in 40 hours.... my flight home is on Sunday at 8 pm... Seems reasonable so-cal isn't that big right??? If you have ever lived there. or perhaps looked at a map, you might laugh at my folly. Southern California is approximately the size of the entire northeast. Also looking at my itinerary... i am traveling in the wrong direction going from LA to SD before heading further north. So I pick up my Kia at 5 on friday afternoon. Always interested in my mileage on trips like these i try and switch out from trip mode which is displaying 150 miles. On the 405 going south at 5:30 on a friday this is proving to be more troublesome than perhaps it could be. 10 minutes in I realize my mistake, the car only has 150 miles on it.... total Neither I nor the car have any idea what trouble we will get into in its early life. 2 and a half hours later I arrive in San Diego to meet Anne Marie for a night out on the town. Some friends surpass distance, time, and occasional lack of effort (on my part) AM happens to be one of these friends. And though our visits are brief and infrequent we manage to reconnect immediately, divulge our most pressing issues we are currently dealing with, and give and receive insightful advice. Talk about high efficiency friendship! After a great night out, they gracefully let me stay in the guest room at their new house. The adventure fire still burns and at 4 AM I am in the car and driving north. AM couldn't get to Jtree for the weekend so I decide to go up to the Needles and try and get on Dome Rock where I had been a few months before. I love driving a road for the first time. Especially at first light, and coming up the 15 through San Bernadino and on into the Mojave as dawn comes around was pretty special. From desert to metropolis up over the hills and back down into the desert. I drive around lake Isabella (the last bastion of civilization) and up into the southern-most foothills of the Sierra Mtns. 80 miles laters, and up at 8000 feet I get to Dome Rock. Dome Rock is my Needles cop-out. The needles are steep and hard with climbs starting at hard 5.9 and getting harder, not that I cant climb that... but solo, at 8500 feet, and 3 miles from the nearest "road" that is pushing the envelope out a little farther than I would like. So Dome Rock is the same perfect rock, but lower angle, and longer up to 5 or 6 pitches! Rope soloing is a funny experience. The climbing by design is technically easy, but regardless the amount of work to do to get up a sizeable chunk of rock can be immense. For every pitch (in this case 150 feet or so) you have to first climb, then build an anchor, rappel and clean the pitch, then climb it again. Repeat till you get to the top. The beauty comes in both the rhythm you get into, and the total self-sufficiency. Hard to even explain how enjoyable this experience was to me. Perfect rock, place, movement, and for me that day being alone made the experience so much more visceral. Suffice to say this was the best rock climbing i have done in a very long time. On top after 3 hours of sustained movement, I am in a good enough mood to make friends with strangers *gasp* and even chit chat with fellow climbers for an hour or two at the parking lot. The obligatory summit hdr pano, check this one out, i am working through a new flash panorama viewer just click the picture. Its still only 4pm and the previous nights short sleep and the mornings long drive havent caught up to me yet. I head over to a little pullout I saw earlier about 10 miles back down the road, 100 Giants. After an hour or two walking around the grove, I head out, near sunset to go grab some food at the only establishment for 50 miles. It takes me a while to get there as the sunset is suitably stunning. Dinner at the Ponderosa Lodge ends up being the only thing to mar the day... sub par service and worse food. Though the beer in large mason jars is pretty tasty. Its 7 or so, im finally tired, but the flame of adventure still burns. I had seen a trailhead called Mineral Spring not too far north... if i could fly. 3 hours of paved road... all the way down the valley up to Visalia then back up into the mountains. Once off the main road. I turn onto the road up to Mineral King only 20 miles to go. The next day i will see what I have driven up... but at midnight after 20 hours on the go I am glad it is dark. 120 switchbacks take me more than an hour until i finally pull my car into a small pullout at 9000 feet. When i step out to pee i notice it is very cold. My alarm goes off at 445 am, the temperature gauge on my car reads 18. But with only 15 hours till my flight takes off i dress quickly and I am on my way. There is no set goal but I hike in the general direction of Sawtooth mtn. an 11500 foot mtn 7 miles from the the trailhead. Despite the cold i warm quickly (no flat ground here) and as the sun rises i am greeted by spectacular scenery. In every direction the land juts to the sky and boulders and talus lay strewn below the peaks. It as if the ground grew too rapidly and violently, brusquely throwing anything and everything out of its way on its race skyward. An hour or two later, at monarch lake i stop to take a few pictures. From here the trail goes up to the ridge and then a short scramble to the summit of Sawtooth. I do not take it. The temperature has dropped precipitously just standing here taking pictures and my light jacket is warm if I am moving only. I have pushed the time, weather, and safety envelope as far as i care to. On the way down it snows from a clear sky, the moisture precipitating snow directly from the heavy air. Back at the car i feel the tug of responsibility pulling me back down the mountain. I regretfully point the car down hill and leave the crisp clean air, and ragged untamed peaks behind. I leave only with a greater sense of self. If you recall I mentioned Nate... looking to learn a bit of aid climbing. So never having met Nate I pick him up at 6am. He (like myself) is really into climbing... and only 20 miles into the drive we are old friends. While not out-right raining it is not pleasant. A drizzle that looks locked in for the day. Luckily Nate and I are eerily similar. Climbers, photographers, we have maps all over our walls, and a penchant for of siding on the side of adventure rather than comfort. So the rain seems like a good thing. Annapolis rocks can be busy, and since we are aid climbing anyway,it will keep most of the climbers away. The rain is certainly not stopping, but the hike goes quickly and we set up below a short overhang. I lead up... which ends up being 5 aid placements and then quickly 4th class to the top of a fin. Unsatisfied we set up move over to Black Crack...a great sustained 5.9 to free climb. This ends up being perfect... long for A Rock with decent but thoughtful gear. I give Nate the lead... testing the second piece... he pops it and takes it a 8 foot fall grounding and just barely missing an ominous stump. Now climbing, and even more aid climbing is a game of the mind. Not only in the specific motions of being deliberate... but in the momentum and in the case of a fall convincing yourself that you can get back up there and do it differently next time. Nate clearly has the head for aid.... I think it is ingrained in genetics. He hops up and 5 minutes later is up past the initial stuff and plugging away. An hour later he makes the top... not bad for a first aid lead. Something about aid belaying... it is perhaps the most boring thing you can imagine... an hour (up to 4 at times!) of just sitting there watching. Not much else. Usually i go aid soloing for just this reason. Today i had a strange experience. When i was in college I made my first 3D movie about the juxtaposition of scale in climbing. Here we are climbing these large formations, but our success depends on such tiny, even microscopic, connections of the rock. Similarly sometimes a small piece of rock can all of a sudden change size and the 6 inch piece I am looking at becomes a perfect 200 foot tall corner. Hey we can all dream and aid belaying certainly spawns thoughts like this. I re-lead the pitch and we call it a day, and hike down. So a good day aid climbing? or perhaps more importantly a new friend... and someone to keep me motivated for the bigger projects that have taken a back seat in the last year. Stay tuned. Things aren't what they used to be. And by things... perhaps I mean my own temperament. I have recently gotten a request from a Mountain Project user Nate Miller who wants to start to learn some aid techniques. Apparently I know how to aid climb and would be able to teach someone. So to make sure that was actually the case I went down to Great Falls VA to do some solo aid climbing and brush up on some of my long rusty (no pun intended) aid skills. I never expect Great Falls to be quiet... and on a beautiful September day my worst fears are realized. It feels like an ant hill as i drive in and see the swarms of people. And not just hikers, but every kind of climber as well.... boy scouts, parents with 9 kids (we only had 8, geez) guided camps... and of course, one pitiful aid soloist looking for 30 feet of rock free from the swarm. Of course the route I am looking to do... appropriately called the aid crack, has with sticky rubber and years of piton use, become a very popular 5.10 free climb. There is a line halfway back to DC at the base. I manage to find a 9 to TR a ways down the river... and eventually get back and get on the crack. The aiding is as tedious and painless as i remember. I meet another solo climber and we TR the crack and then put up a rope on PVO. PVO (Potomac Valley Overhang) is a 12d roof problem with awkward moves through the roof and teeny tiny crimps after. All in all good climbing.... but the crowds and atmosphere remind why I do get out and climb... and it is certainly not the day i had today. Increasingly it is not the quality of the climbs that draw me to the sport... but the quality of the experience that surrounds the climbing experience. I am still convinced that this sport fosters a good experience, but at times.. and certainly in the crowded Mid Atlantic... these experiences can be challenging to find.